Clients often reach out to us to get advice on what to wear. Whether they just want a fresh look for a night out or a full formal look for a special event, we love helping our clients pull their look together. The Black Tux reached out to us and shared this fabulous graphic for the guys, and we wanted to share with you. We know that a lot of ladies help your guy put together their special occasion looks. With the Valentine’s Day holiday coming up next week, we thought it would be a great time to share this piece with you (and with the guys if you are one of our fellows reading along), and we added some fun outfit inspiration photos below to break it down a little further. For a business event, office party or evening out, a casual outfit is the way to go. Dark jeans are always a good option with a printed shirt and staple jacket to top it off, but never be afraid to go simple with a white shirt either. Often times less is more, even for men! Another look we really like is completing the outfit with a fitted top coat. Since Valentine’s Day is coming up, we know the guys especially want to be looking their best. Nothing is better than a perfect fitting suit with a little bit of added personality. 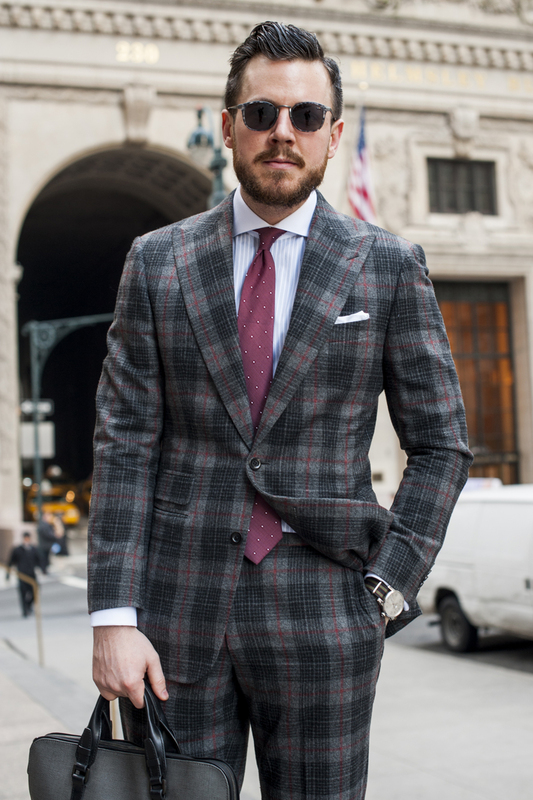 Start with a neutral colored suit such as black, navy, or gray, and add a printed shirt and tie. Don’t have a suit and don’t wear one often enough to purchase? No worries! The Black Tux has you covered! They offer suits and tuxedos in all different varieties that you can rent for your occassion. Feeling like you are wanting something different? Switch it up and wear a colored jacket or pair of pants with a neutral colored corresponding pant or jacket. A classic neutral-colored suit and tie is perfect for an event that requires a little more class, but we also love the idea of doing a suit in a subtle color like this maroon. Lastly, you can never go wrong with a sophisticated black tux and bow tie. If the rules given allow for more creativity, we love some print and pattern mixing, but be sure to keep it in the same color family. If you’re looking for a reliable company to rent a tux or suit from for an upcoming event, be sure to check out The Black Tux. They have made renting easy and convenient, while still providing high quality and custom fitted pieces. To begin, select a style found on their website, or you can even create a custom look. Provide them with your measurements online, and the suit will be delivered to your doorstep. Lastly, if you are struggling to put an outfit together or can’t seem to find the perfect piece you’re looking for, don’t hesitate to contact us. We love working with clients no matter how big or small the task!